To say that I love pasta would be an understatement. Growing up I was a very picky eater and my mom had a horrible time for a couple of years getting me to eat anything other than McDonald's or cheese. I was lucky that I was so active in swimming, dance and running that I burned off the McDonald's and cheese without consequences, but my mom realized that neither constituted a healthy diet. Then one day my mom decided to make me an Asian noodle dish that she created. I can still remember the first time she made it, I fell in love. To this day it is possibly the best thing that I have ever eaten. With this success my mother branched out to cooking other pasta dishes, with similar reactions from me. So throughout my teens pasta became a household stable. Once I moved out on my own I ate a lot of pasta, but rarely if ever cooked any recipes at home. After getting married I started cooking as much as I could. It was a great way to relieve the stress of working on my thesis and I found some delicious recipes. Now I cook with my two boys and they have the same amount of zest towards pasta that I do. Recently we tried a recipe for Rigatoni in Tomato Sauce from Saveur magazine. This recipe has 13 ingredients. It takes an hour and a half of cooking time and 15 minutes of prep and makes 6-8 servings. I had no problems finding any of the ingredients at my local grocery store. I did make a few modifications. I chose to leave off the sliced parsley leaves, I struggle with my two boys with eating parsley especially when it's used as a garnish. For the onion I used a vidalia sweet onion, I love them when they are in season and use them frequently. To crush the tomatoes I place them in a plastic bag, seal it and break the them apart with my hands. This makes for a much less messy clean-up. Finally, for the cheese I used Romano since it was what I already had in my fridge. I followed the remainder of the recipe as written. I love simple recipes full of flavor. This recipe was easy enough that my two boys were able to help me in the kitchen, while still retaining taste. It would work with a variety of pasta types including spaghetti. Plus it made enough for dinner for my family of four plus leftovers for lunch the next day. Overall, an easy pasta sauce recipe that is versatile enough to be used with spaghetti, bow ties etc. 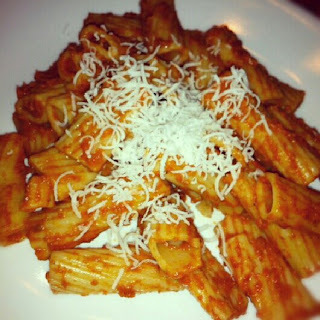 For the link go to Rigatoni with Tomato Sauce.